Fill 3/4 th of the bottle with oil. Fill the rest of the bottle with water. Add ten drops of food coloring liquid which should be enough to turn the color of the solution to a dark one. Cut the Alka-seltzer tablets into pieces. You can put them in to the bottle for one mega effect or use them one by one whenever you want to make a demonstration. You can also use salt in place of these tablets. These tablets will make your bottle bubble and you will have to add more whenever it stops. 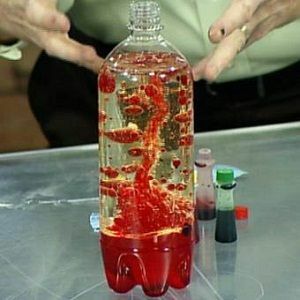 Shake the bottle back and forth so that the water droplets join together to make bigger ones and give a lava effect. To have a dramatic effect and impress others, shine a flash light under the bottle. The illumination gives wonderful visual effects. This activity fascinates kids especially. You can turn in to an educational one by explaining the science behind it and the nature of water and oil. You can also tell them about the formation of lava and its effects. However, do warn them as to never warm the bottle in case they try heating it for real effects.